So You Want to Work in Sports? 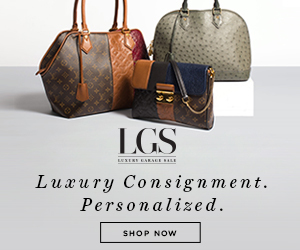 Here’s a Day in the Life of Your Dream Job | Gina Miller's Blog - A working mom's blog about fitness, travel, handbags & beauty. 8am: Head to the hotel lobby to FaceTime with my daughter and husband. 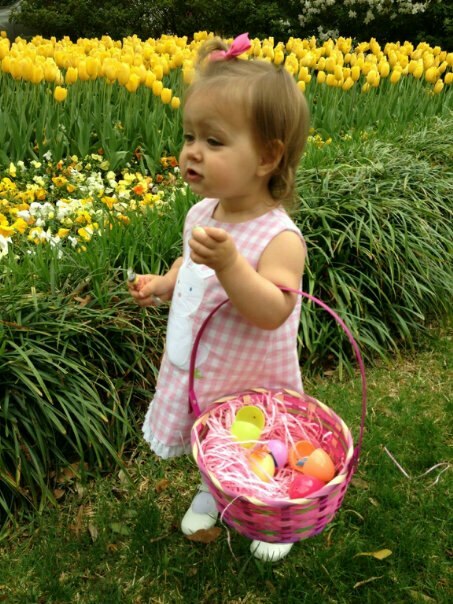 Jordan's 1st egg hunt. I missed all the fun this weekend! 8:15am: Workout for 45 minutes. I’m always fighting that extra 10 pounds a camera adds. 9am: Breakfast and blogging about things to do in Houston. 10am: Back to the room to pack. 1:30pm: Arrive at Hilton Americas. Start getting dressed immediately with big hair and TV anchor makeup. 2:45pm: Leave for Minute Maid Park. It’s about 8/10 of a mile from the hotel, so we walk. 3pm: Arrive at the park, get credentials, go through security and get lost in the bowels of the facility trying to find the Rangers clubhouse. Talk to producer at the station about our plan for the evening. 3:30pm: Rangers clubhouse opens. 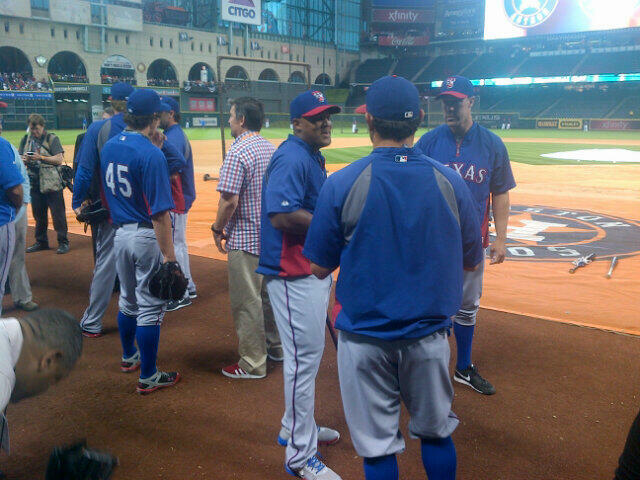 We interview David Murphy, Lance Berkman, Mitch Moreland and Ian Kinsler. Adrian Beltre and AJ Pierzynski turn us down for interviews. 4:30pm: Interview Ron Washington amidst a gaggle of reporters in the Rangers dugout. Once done with Wash, we start shooting video and gathering interviews with fans for our story on Opening Day that will air on the Score on CBS11 later that night. 5:15pm: Fight our way upstairs to the press box to see if there is a seat for us to watch the game and space for Bill to set up equipment to begin editing our story. No space, as they are at maximum capacity. Reporters are sitting in the dining room and at spare tables in the hallway. Bill and I go downstairs to find a space to work. 5:30pm: Set up shop in the Astros press conference room on the completely opposite side of the Park from the Rangers clubhouse, about a four-minute walk. I begin logging sound and video to write my story. 6pm: Done writing story. It’s time to voice audio. There is no ideal sound proof area to record audio, so we use the Astros cloth press conference backdrop to muffle the sound. A photographer from a Houston station leaves the room in the middle of our tracking session, so I start over. Repeatedly. It takes me three or four attempts to get the audio recorded. By now it’s freezing in the press room. Bill and I are shivering. There is no cell service in this room. We have to leave the room and walk to a lobby area for text messages or phone calls. Luckily the building’s Wi-Fi signal works in this room. 6:20pm: Both of us are starving. I trudge back to the press room to grab something to eat. Bill is hungry but wants to edit this story and get it done. He asks me to get him a pretzel. 6:30pm: Buy media dinner for $10. I broke my fork trying to cut the meat offered. I take about three bites of everything: the freezing iceberg lettuce, the hard meat and greasy potatoes. I try the popcorn. It’s stale. The frozen yogurt isn’t bad. I leave to get Bill’s pretzel. Every concession stand is packed. By the time I have waited my 22 minutes and get to the counter for his pretzel, this particular stand has run out of them. I try to text Bill to see if he wants something else. He doesn’t get the text because of the bad cell signal. I march back to the press box to grab him one of three hot dogs left on the roaster. It looks like it’s been sitting there for four hours. 7:45pm: Finally get back to our base in the bowels of Minute Maid Park. Bill gets his cold hot dog. I finally get the chance to watch the game on a TV in the press conference room. 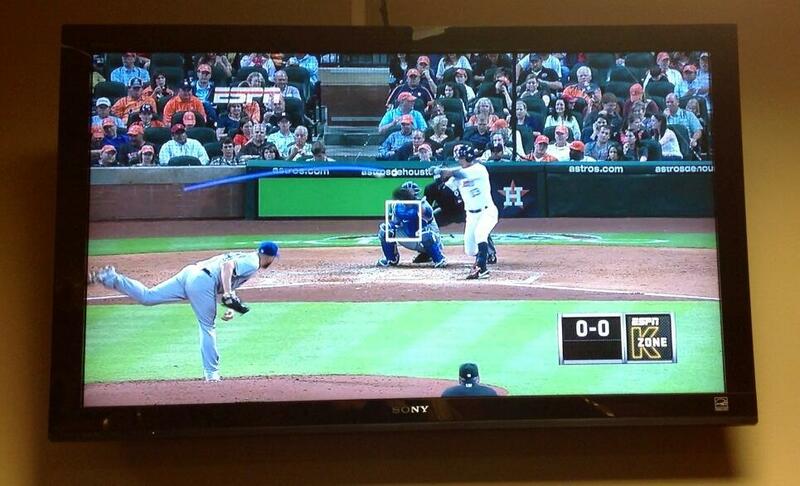 I don’t actually see a single pitch in person. The Astros radio broadcast is piped through the TV. I use my MLB at Bat app to listen to Eric Nadel and Matt Hicks. In a rush to leave my hotel room, I leave my iPad charger in the room. I have to conserve battery life to use my iPad later in the evening so can’t listen to them continuously. My view of Lyle Lovett from the bowels. 10:05pm: It seems to take longer than usual to get into the clubhouse after the Rangers 8-2 loss. We enter Wash’s office. Rangers PR guy John Blake says that TV reporters will ask questions first followed by print media but every media person packs Wash’s tiny office. I ask two questions and leave. 10:30pm: Interview Matt Harrison, Derek Lowe and AJ Pierzynski. Get 1-on-1 interviews with Nelson Cruz, Elvis Andrus and David Murphy. Bill points out it’s getting late and we need leave for our live shot location. 10:50pm: Arrive to live shot location outside Minute Maid Park. We need to feed back the interviews we gathered. We are working with our Houston “sister station” KTRK. Their technology is not compatible with ours so we must feed our material a second time using our “backup” equipment brought with us from Dallas. The video quality is not that great. 11pm: Touch up hair and makeup for live shot. Begin gathering my thoughts to determine how I am going to introduce my postgame sound and story that we shot earlier in the day. A nice young lady from Dallas starts asking me how to break into the sports broadcasting business. I chat with her for about 10 minutes. I’ve only spent five solid minutes preparing what to say before I am on television. The bum rush...wasn't nearly as bad as it felt. 11:15pm: In place for our live shot. An over-served fan shouts to us “Go back to Arlington!” His wife drags him away. Bill is still feeding material to our station. A photographer from KTRK is shooting my live shot. There is a monster truck cruising up and down the street behind us while sitting on his horn. 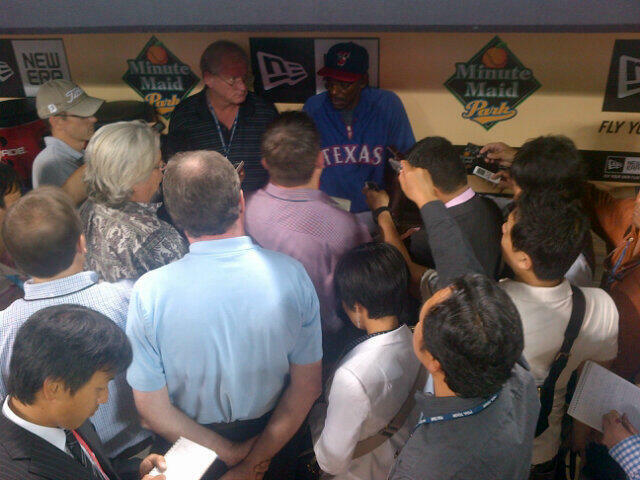 Once I begin introducing my postgame interviews, I notice the KTRK photographer shaking his head “no”. I feel a brush of air over my right shoulder. Out of the corner of my left eye I see Bill rushing towards me. He pushes a drunken Astros fan out of the way. Bill says this guy was charging towards us. I turn around to see briefly what’s happening. I think I stumble on my intro. 11:19pm: Our live shot is over. Bill can’t believe that guy came out of nowhere. My heart is still pounding because it freaked me out so much. We break down our equipment and walk back to Hilton. 11:45pm: Arrive at the hotel. We’re starving. Again. There is a lone Easter basket leftover from the hotel’s egg hunt with some Reese’s peanut butter cup miniature candies. I grab six of those and go to the room for my “second dinner”. Bill later tells me he ordered room service. It finally arrives at 12:45am. $42.50 for a chicken sandwich and carrot cake. 8am: Leave for Dallas and write this post in the car on the way home. Noon: Arrive home. My daughter runs away when I try to hug her. I think that despite FaceTime, she forgot about me. While we’re not always on the road, we travel a fair amount. In fact our days are jam-packed a little tighter when we’re at home. Long days with unexpected surprises and a few speed bumps are the norm. Is this an easy job? No. Is it fun? Without question. We wouldn’t have it any other way….except the no-hug part from Jordan.